Making dolmathes with rice is the traditional recipe made in most Greek households . Recently, I catered a party and the request was for dolmathes stuffed with something other than rice. 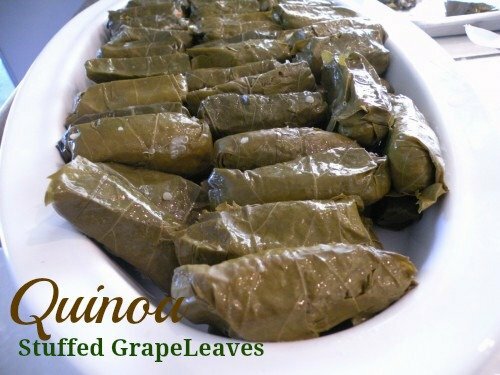 I changed the recipe from rice to quinoa stuffed grape leaves for the added nutritional value . They were a hit! The recipe can be made with quinoa , rice, or bulgar. I make these appetizer size during the holidays. And if you need time to set up and clean your house, this is a perfect party food because you can freeze them ahead of time, and cook them the night before. They can be served at room temperature or warm. Serve these grape leaves with the yogurt dip called Tzatziki sauce. I have provided Cooking Techniques for this recipe . An updated version of the traditional Greek Dolmathes is this more healthful dish using the seed "Quinoa". A pure protein to improve and make this dish a winner! Carefully separate the leaves, so they do not tear. Lay out to dry on a towel, paper towel, or on a sieve. Chop the onions in a food processor or by hand. In a large saute pan add the oil and the onions, tomato, and lemon juice and cook on low for 20-30 minutes until soft, not browned. Cool. Place pine nuts in a frying pan and cook on medium until lightly brown. In a large bowl place the onions, uncooked quinoa, dill,salt and pepper and pine nuts and mix well. Before rolling prepare your pan. Place slices of lemon on the bottom of a deep dutch oven. Lay one leaf at a time on your work surface. Snip off stem. Veins side up! Place stem side of leaf facing you. Begin rolling your grape leaves. Snugly lay the grape leaves on the bottom of the pan. Continue rolling and layering until all the rice is used up. Cover the last layer with sliced lemons. Add a layer of grape leaves. Freeze at this point. Tightly cover your pot with clear wrap then foil. When ready to cook, continue with recipe. Do not need to defrost but add 15 minutes on to cooking time. Pour 6 cups of water into the dutch oven. Place a plate over the top of the leaves to keep them from floating to the top. Place the cover on the dutch oven. Bring to a soft boil, and reduce heat to low, and simmer for 45 minutes. For a party: Cook these the night before and refrigerate. Can be served at room temperature. © 2010 – 2018, Mary Papoulias-Platis. All rights reserved. Thanks for visitng my site! Enjoy, this recipe we do in our family! Thanks for visiting my site! Yes! Just cut it in half and buy a small bottle of grape leaves.Good Luck! Do you have to freeze? No, not at all Cheryl.